Apparently Target has its own line of smart lamps, for which the US retailer released an iOS app called Target Connected back in October 2016. Now that app is available for Android devices, though without Google Assistant integration or any groundbreaking features, it's far from anything to get excited about. Oh, and it tries to sell you stuff from Target.com. Target Connected can be used to control the retailer's Threshold Ara Smart Lighting Collection, which currently comprises just two items. The Play Store listing for the app also features an unlisted YouTube video about Target's Sweet Slumber Collection of smart nightlights, which can be controlled using Target Connected. The link in the app listing pointing to Sweet Slumber lights leads to an empty page, but it's not too difficult to find the correct page for those lights (they're not in stock yet). Control Panel: This screen has tabs for "Devices," "Room Scenes," and "Smart Actions." From "Devices," you can tap into individual lights to control settings like temperature, brightness, and custom names. From "Room Scenes," you can group individual lights together to sync and control them as one. From "Smart Actions," you can set timers for lights or automate them based on time of day or location. Connected: This is where Target shamelessly tries to sell you smart-home devices, though this may be because I don't have any of the retailer's compatible lamps connected to the app. Tapping a picture takes you to the corresponding Target.com product page where you can complete your purchase. More: FAQ, contact, and privacy information can be found here. You can also delete all settings from this screen. 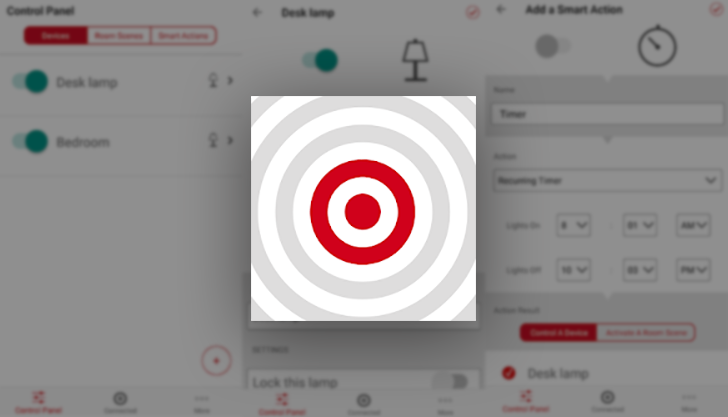 If you happen to own one of Target's smart lamps, use the widget below to download Target Connected. Just keep expectations low, especially since you won't enjoy any Google Assistant integration. It would seem to make a lot of sense for Target to follow Ikea's example and add Google Assistant compatibility for its connected lighting. 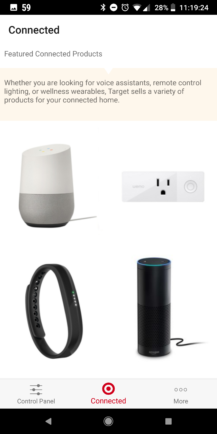 Maybe that would boost the number of Google Home purchases made via Target Connected.